Fifty years ago this week, the Left Bank in Paris was rocked by student protests, later followed by workers’ strikes. Revolution was in the air. I can’t claim to have been there then, though I watched as much as was available on British TV news. I was studying French ‘A’ level at the time, my mind totally caught up in the works of Albert Camus and André Gide, and I had been to France the year before on an exchange visit (as recounted in my childhood memoir, Eccles Cakes). So the cobblestones that the student activists were tearing up from the streets of Paris to hurl at police were still vividly in my mind. I had already become very political — with the Young Liberals, some of whom were branded Red Guards by the then party leader, Jeremy Thorpe, in mocking reference to what was happening in China’s Cultural Revolution. But neither we nor many of the students in Paris were Marxists, being more libertarian with a touch of anarchist, though I was totally opposed to violence. I longed to go over to join people at the Sorbonne, but with exams looming that was hardly feasible. And after a few weeks the whole thing fizzled out. General de Gaulle — who had fled to an army base in Germany at one stage in the protests — called a general election and the Gaullists were returned with an overall majority in the National Assembly. The bourgeoisie had won. Yet May 68 did leave an indelible mark on that generation of French youth, as well as impacting on cinema and other aspects of French culture. And it convinced me that I would live in Paris at some stage in my life, though it was to be another 12 years before that happened. Looking back now it seems impossible that les événements were half a century ago, as they are still so fresh in my mind. It’s even weirder to realise that half a century before that, young men were dying on the battlefields of the First World War — which as an 18-year-old I had thought of as ancient history. 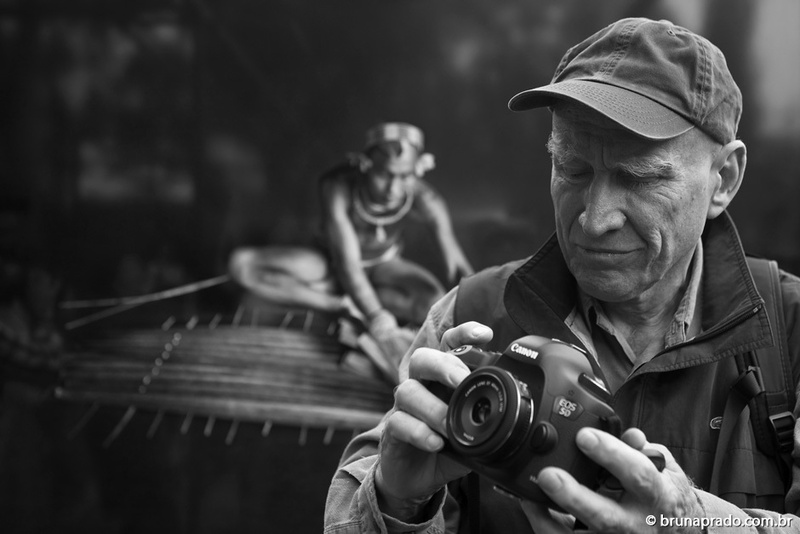 The artist Clive McCartney is inspired by the power of the sun. Light and movement are all, as witnessed in so many of his canvasses in the exhibition currently running at the Catto Gallery in Hampstead. 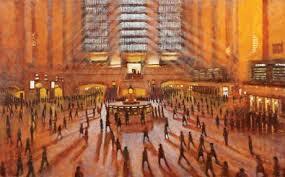 His visions of Grand Central Staion in New York, busy with faceless travellers, as well as his exteriors of almost deserted Paris café terraces are particularly affecting. Had I a spare square two metres of wall space in my house, I would happily buy one. He is far more confident in acrylic on board that oil on canvas, and some of his London views, such as Greenwich from the top of the hill in the park, are disappointing. But the rest more than make up for this. 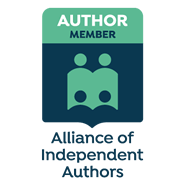 He is an artist supremely conscious of place, as well as the light that iluminates it, and even if Paris and New York might seem old hat as themes for an Engushman abroad — even one based in Tunbridge Wells — he brings something fresh and appealing. Go and see the exhibition. I don’t think you will be disappointed. Given the blanket media coverage of events in Paris over the past week many people will probably have missed the distressing news that on Friday, after midday prayers, the Saudi blogger Raif Badawi received 50 lashes in a public flogging, an act of medieval barbarity that is due to be repeated another 19 times on Fridays until the full 1,000 lashes sentence imposed on him for using electronic media to “insult Islam” has been implemented. Other words banded about in his case have included blasphemy and apostasy (renunciation of one’s faith), the latter meriting the death penalty in some extremist Islamic states. Of course, to any rational modern human being these “crimes” are not crimes at all and certainly do not deserve harsh punishment. I do not believe in gratuitously insulting someone else’s religion, but surely God and the Prophets are strong enough to stand up for themselves in the face of any such criticism, satirical or otherwise? At the heart of the Je Suis Charlie demonstrations in France and elsewhere, in the wake of the murderous attacks in Paris, was the principle of free speech — an essential element not just of modern western civilization but of universal values of human rights, thanks to the UN Universal Declaration of Human Rights, which has been signed by all members of the UN, including gross abusers of human rights, including Saudi Arabia. The Saudis base their antediluvian approach to blasphemy and other such “offences” on their strict Wahhabi interpretation of Islam, which was, frankly, outmoded in the late 18th Century when it arose, and when the Enlightenment was sweeping Europe, let alone now. 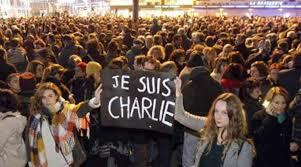 On Sunday, a wide range of world leaders gathered in Paris for the Je Suis Charlie march. But many of these same leaders are themselves guilty of curbing free speech, persecuting and even killing writers and journalists. All have a duty to improve their own records, as well as turning the spotlight on the worst culprits, including Saudi Arabia, applying sanctions where appropriate to reinforce their message. 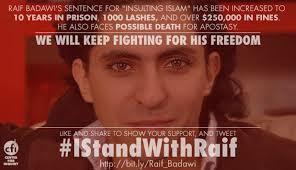 Those countries that still have blasphemy laws should repeal them now. ‘Everyone is born in a poetic state,’ the Syrian-born writer and artist Adonis declared in an interview with Hans Ulrich Obrist at the Mosaic Rooms in Kensington this noon. But not everyone is destined to express themselves poetically. The sprightly octogenarian — who is viewed by many as the most significant Arab poet alive today — had humble beginnings in a remote village in the French mandated Syrian territory round Latakia, in which electricity and cars were unknown. But he got a lucky break through his own juvenile audacity. In 1943, after Shukri al-Kuwatli was elected Preaident, the new head of the (still not formally independent) state toured the country, to get to know it better. When the 13-year-old Adonis (original name Ali Ahmad Said Asbar) heard of the impending visitation, he told his father that he wanted to read a poem he had written to President al-Kuwatli, as he was sure the president would then ask him what he would like in return, the answer to which was: to go to school! And that is exactly what happened, according to his testimony today. He studied and wrote and became politically active, which resulted in his being sent to prison for several months. But in 1956 he went into exile in Beirut, leaving there for Paris in 1980 to escape Lebanon’s Civil War. Exile from the Middle East was probably wise, despite his being born into the Alawite sect of Shia Islam from which the current al-Assad ruling family and cohorts in Syria hail. 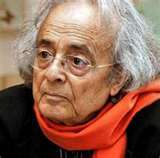 Adonis himself is a-relgious, though very interested in Sufi mysticism. He argues that the ‘decadence’ of the Arab world began with the fall of Baghdad in 1258 and continues today, though he draws some encouragement from the young activists of the present Arab Aakening, ‘though they have been betrayed by the fundamentalists.’ He is scornful of any country, including Israel, being based on a religious faith. His years in France have given him a very French understanding of positive intellectualism and the power of profound thought. All great artists are also thinkers, he believes. 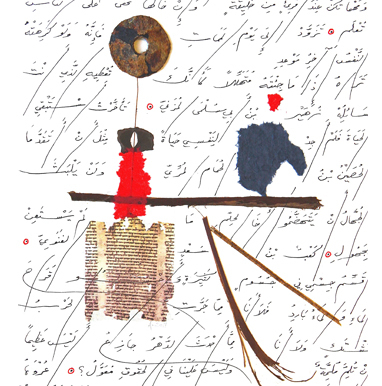 He himself produces striking collages which combine extracts of handwritten text with fragments of everyday objects. An exhibition of his work can be seen at the Mosaic Rooms 1100-1800 Monday to Saturday until the end of March and there are a couple more events with the poet himself next week. This weekend in Paris the usual tide of pilgrims to the tomb of Irish playwright Oscar Wilde were able to see the product of approximately 40,000 euros-worth of renovation, most of that funding being provided by the Irish government. The maginificent carving by Jacob Epstein — commissioned by Oscar’s friend and patron, Helen Carew — has sat in the Pere Lachaise cemetery for over a hundred years, but over the last 50 or so it has suffered from repeated assaults by the passionate lips of female admirers, who left stains of lipstick all over the solid base. Not only did this require considerable cleaning to get the marks off, but there had even been a corrosive effect on the stone. To prevent this happening again, a two-metre high plate-glass screen has been erected round the cleaned tomb. Some fans are distraught and a few lip impressions have already appeared on the glass. But I think most Wildeans will concur with Oscar’s grandson, Merlin Holland, who unveiled the restoration earlier this month and who was not only concerned about the damage being done to the monument (which had its prominent genitalia chopped off by a vandal some time in the 1960s) but also argued that the effect of the kisses was unsightly. The glass screen itself is pretty unsightly, it has to be admitted, but at least it should perform a useful function. 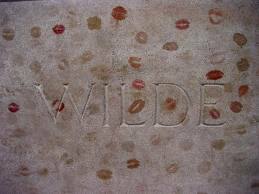 Wilde himself would be amused that 111 years after his death he is still hailed as a literary genius as well as a social reformer and (some would argue) LGBT martyr, and that his tomb is the subject of so much conversation in Paris. But as he himself said, there is only thing worse than being talked about and that is not being talked about. 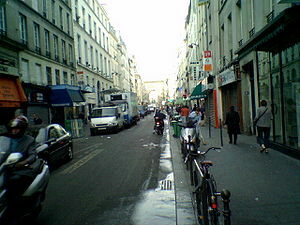 Of all the streets in Paris, the rue du Faubourg St.-Denis is my favourite. The photo doesn’t really do it justice, as it is one of the most colourful and multicultural thoroughfares in the French capital. French delicatessens jostle with Turkish and Mauritian grocers, Indian restaurants and a whole series of Arab and African telephone centres and internet cafés. Three hundred years ago, before the French Revolution, it used to be very grand, but now its popular edginess is its greatest attraction, at least for me. There used to be street stalls as well (which featured in Jean-Luc Godard’s film ‘Une femme est une femme’), but they were long since evicted. Nonetheless, it’s still a great place to do one’s daily food shopping — a habit I acquired when I lived here 30 years ago and have not abandoned in London, where the ‘weekly supermarket shop’ culture reigns supreme. Eating fresh produce and being able to choose which particular vegetable or piece of fruit one wants, unhindered by packaging, is a facet of the quality of life too many people in London have sacrificed. 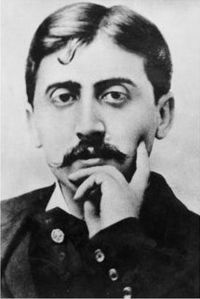 This week I will start teaching a new course on writing non-fiction at City University in London, the first class being on Nostalgia and Selective Memory, with Marcel Proust’s Du côté de chez Swann as the core text. As I haven’t read the opening volume to A la recherche du temps perdu since I was at university myself, I’m spending the weekend reacquainting myself with the text, by coincidence in Paris, whither I came from Stockholm, staying in the same area of the Xème arondissement where I had a tiny studio flat nearly 30 years ago. Paris is the ultimate city to walk in, full of small neighbourhood shops of the kind that have been squeezed out by high rents in most areas of London. Many are the same as were here when I left all that time ago, or else are being run by the sons or nephews of the proprietors I knew. As I head across town towards the Boulevard Haussmann, I can imagine the invalid Proust in situ there, and the smell of baguettes and fresh coffee in the morning brings back memories of times lost but not forgotten.